College football is both the best and it is the worst. The joy of victory is so easily ruined by the despair brought by defeat. We must all persevere throughout the season. Alma Mater’s halls couldn’t get it done. The Ole Miss Rebels struggled defensively throughout the game and Arkansas deserved to win this game. I think the Razorbacks had a better plan and they dominated the game with their offense. The Razorbacks possessed the ball and limited the number of possessions the Rebels received. 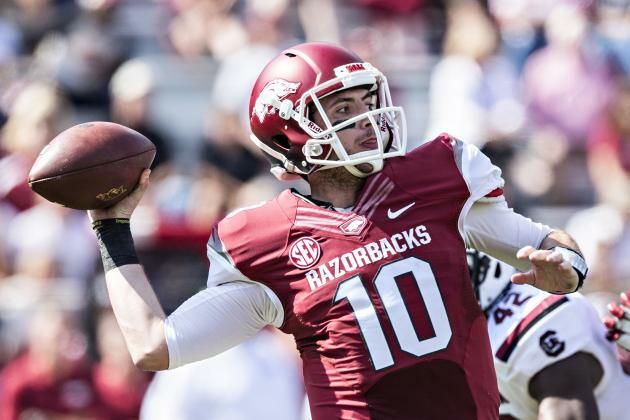 Brandon Allen played a stellar game and Ole Miss had no answers for the Arkansas passing offense. I thought Ole Miss played pretty well and the offense was really sharp. Chad Kelly played one of the best games that Ole Miss has seen from that position in a long time. Kelly was 24/34 for 368 yards and thee touchdowns. He also added 11 carries for 110 yards and three touchdowns on the ground. I can’t remember a better game by an Ole Miss quarterback. He was fantastic and it’s a shame that he (and Brandon Allen for that matter) didn’t get more help from his defense. I think Ole Miss has to make a serious adjustment defensively at some point soon. The Rebels initially played a 4-2-5 scheme in order to put their best players on the field. I think, at this point in time, that Freeze might adopt a more traditional approach. I could see Ole Miss shifting into a 4-3 scheme. I thought the defensive strategy was pretty bad and the adjustments made at halftime were clearly not beneficial. The defensive backs have struggled most of the season when facing decent competition. Is the problem due to personnel or coaching? Hugh Freeze will have to decide. The Cowboys brought the noise to the Horned Frogs. Trevone Boykin, who is typically fantastic, made some pretty serious mistakes and the Frogs’ defense was a mess. The Cowboys jumped out to an early lead and the game was out of hand quickly. I believe Oklahoma State is underrated and should be moving up the rankings after an emphatic win. The Cowboys defense is strong along the trenches and forces plenty of turnovers. I thought the final score didn’t indicate how thoroughly the Cowboys dominated the game. Trevone Boykin still had 518 yards of total offense and three touchdowns. He did throw four interceptions and the Frogs couldn’t find any offensive rhythm. Josh Doctson suffered a wrist injury and the Horned Frogs looked exposed. I suppose the injuries to the TCU defense were finally too much to bear and the Cowboys (despite only have the ball for 22 minutes and 54 seconds) rolled up 456 yards. The box score will show that the Cowboys gave up 663 offense yards and 36 first downs (which is an alarming number). I don’t think the final stats should be viewed as a knock on the Cowboys. TCU ran 110 plays and the Cowboys offense was scoring points so quickly that the defense played almost the entire game. Mason Rudolph, a true sophomore, threw five touchdowns on only 16 completions. The Cowboys look like a CFB Playoff possibility. Alabama won this game by about 100 points. Alabama crushed LSU with an run-oriented offense and amassed 434 total yards (compared to only 182 yards for the Tigers). Alabama also possessed the ball for almost 40 minutes and the game was rarely in doubt. Alabama’s pro-style attack, which can also go no-huddle, looked sharp and Lane Kiffen deserves more credit than he receives. Jake Coker, who hasn’t thrown a touchdown pass since October 10th, continued to be mediocre. He continues to throw short and avoid turnovers. He also has a propensity to take hits when it’s not necessary. I know he’s tough and likes to display toughness, but c’mon man! Derrick Henry was dominant and took 38 carries for 210 yards. Henry finished with three touchdowns. The Alabama defense seemingly knew what LSU was going to do before they even did it. LSU’s offense is so simple and predictable. I think the Tigers will need to adjust their attack or they’ll lose to Alabama for the next decade. I seriously don’t understand how a team can run the same stuff over and over and beat Alabama. The Crimson Tide has seen the same LSU plays for the past five years. The Tigers reluctance to adapt is killing them right now. Brandon Harris is at least as good as Jake Coker and somehow he looked so much worse in this game. It’s hard to impress when you get dominated up front and the opposing team knows EXACTLY what you are going to call. Leonard Fournette had 19 carries for 31 yards and one score. Fournette is still the nation’s best player, but a running back needs plenty of help and he didn’t get any. Mississippi State won in the flooding rain against Missouri and has many thinking the Bulldogs could give the Crimson Tide a scare in the upcoming week. Dak Prescott scored his 100th touchdown and he’s not going to be celebrated the same way because he’s at Mississippi State. It’s a shame because he’s a great player. Baylor looked average in a win over Kansas State. The Bears miss Seth Russell’s running ability and their defense couldn’t stop the run. That’s going to make me doubt their chances going forward. 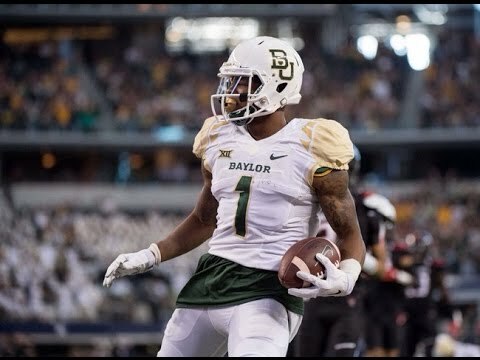 Corey Coleman is the man. Trevone Boykin is still the nation’s best quarterback and he’s still in the Heisman debate. Memphis gets blown out by Navy and their dreams of crashing the party are over. Houston is still undefeated and the AAC needs them to stay that way. Ohio State doesn’t look the same without J.T. Barrett at QB. Florida owns the SEC East title and beat Vandy 9-7. A win is a win, right? Auburn beat Texas A&M and I can’t wait to see the next episode of the soap opera that is Aggies football. Jeremy Johnson, a Montgomery, AL native, started and had a good game against the Aggies. I am happy for him and thought the coaching staff gave up on him too early. Nebraska got a win on a debatable call and I think I’ll just leave the hypothetical arguments to everyone else. The CFB Playoff rankings mean nothing right now and nobody has played anyone. The CFB Playoff rankings mean everything and some teams have played a gauntlet. Those teams are your teams and they are not being respected enough. I must admit that there has been a lot of change in my ballot. The previous ballot, which isn’t a real ballot for the Heisman trophy, was submitted last weekend. It is a testament to the mercurial nature of college football. Coleman has 20 receiving touchdowns in only eight games. He’s the most dominant receiver in college football and is having one of the best seasons in CFB history. I think he’s in a position to win the award today because Seth Russell is injured. He won’t lose any votes to any teammates and his team is still undefeated. Coleman could conceivably catch 30 touchdown passes and eclipse 1,750 yards. I think he’s a risky pick and receivers are typically not going to win the award. Henry has 218 carries in only 9 games (174 carries in six conference games) for 1,254 yards and 17 touchdowns. I think he’s the safest bet at the moment. He’s getting tons of touches and the volume will help his stats. Alabama already has one loss and a second loss would end his campaign. Henry should have a great chance to win the award if Alabama continues to win. I think Henry is a tremendous college player and his production is as steady as it gets. Boykin, my preseason pick, didn’t help himself over the weekend. He threw four interceptions and the Horned Frogs now have a loss. I think, since there are still several weeks left, that this game won’t totally eliminate him. He’s got a few weeks left and still has been sensational. Boykin has 3,970 yards and 37 total touchdowns in only nine games. Boykin’s worst game will still yield plenty of nice stats and if TCU finishes the season strong then he might still win. McCaffrey is putting up tons of yardage and he’s on a team that’s a contender. I am afraid that people won’t really get to watch him enough and he’s a running back not named Derrick Henry. He’s probably more likely to get invited and not win than anything else right now. Watson is a great player and his stats probably don’t reflect how good he is. He’s the best player on the best team and that’s always a recipe for Heisman success. I don’t think he’s going to have the numbers that some of the other players will have. He needs Clemson to be undefeated in order to have a chance at the award. The (Not So) Little Guys Week 10: Where’s the Love?